The Tewkesbury Poor book of 1801 lists a Joseph Bishop as living here, paying $5 10s rent and 5s 6d rates. This house is a Georgian building and is about eight feet wide. 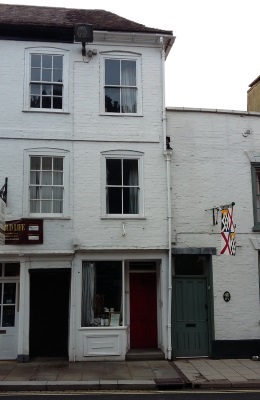 The 1801 Tewkesbury Poor Book states a Joseph Bishop lived here paying £5 10s rent and 5s 6d rates. From 1851 is was the home of boot-makers, first mentioned was Thomas Harris, a cordwainer (for boot-makers) and his wife, Mary. Their son Francis worked at the silk mills – he was twelve years old. In the census of 1861 the occupant was John F.Smith, boot-maker and his family. John Smith was born in London but married locally and prior to moving here lived in East Street, Barton Street. His wife Mary Ann, and son John F.Smith aged 14 were also recorded as boot-makers on these premises. John F.Smith senior continued to run the business until 1885, his son William Smith working alongside his father. In 1889 only Mary Ann Smith appears as the head of the house and shoe-maker. William Smith and his wife Catherine (a seamstress) ran the family business from 1891 until 1914 with the trade of boot and shoe maker. 1835 the shop was a green grocers. Mrs Marylyn Mountford (nee Jones) was the last to keep a shop on the premesis and that business closed a few years ago. In the window, in the small shoe, rather battered, in the white box was found under the floorboards of the house and was a traditional token placed for good luck. It would be nice to think Thomas Harris made it. Thomas Harris; Head; Married; Male; 62; Cordwainer; Born Tewkesbury Glos. Mary Harris; Wife; Married; Female; 56; Cordwainers Wife; Born Pershore Worcs. Frances Harris; Daughter; Female; 12; Silk Mill; Born Tewkesbury Glos. John F. Smith; Head; Married; Male; 39; Boot & Shoe Maker; Born London. Mary A. Smith; Wife; Married; Female; 34; Boot & Shoe Binder; Born Tewkesbury Glos. John F. Smith; Son; Male; 14; Boot & Shoe Maker; Born Tewkesbury Glos. Harriet Smith; Daughter; Female; 11; Scholar; Born Tewkesbury Glos. George J. Smith; Son; Male; 2; Scholar; Born Tewkesbury Glos. William Smith; Son; Male; 7months; Born Tewkesbury Glos. John F. Smith; Head; Married; Male; 49; Shoemaker Employing 3 Hands; Born London Middlesex. Mary A. Smith; Wife; Married; Female; 45; Born Tewkesbury Glos. William Smith; Son; Single; Male; 10; Scholar; Born Tewkesbury Glos. John F. Smith; Head; Married; Male; 59; Bootmaker; London Middlesex. Mary Ann Smith; Wife; Married; Female; 55; Sewing Machinist; Born Tewkesbury Glos. William Smith; Son; Single; Male; 19; Bootmaker; Born Tewkesbury Glos. William Smith; Head; Married; Male; 30; Shoemaker;b. Tewkesbury Glos; Working On Own Account. Catherine Smith; Wife; Married; Female; 27; Laundress In Shirt Factory;Born Tewkesbury Glos; Employed. John F. Smith; Son; Male; 5; Scholar;b. Tewkesbury Glos. Mary A. Smith; Daughter; Female; 3; Scholar;b. Tewkesbury Glos. Mary A. Smith; Mother; Widow; Female; 65;b. Tewkesbury Glos.